‘Tis the season to put teams out. So here you go. You can probably argue a better player in each position, but you can’t argue with the fact that I enjoyed watching them. Delighted to hear your favourite Aviva Premiership XV 2016/17 – stick it in the comments down below. 15. Tom Marshall – Marshall has had some genuinely sublime moments this term, but like his Gloucester counterparts, hasn’t been able to put things together consistently. At his best, he finds space effortlessly; at his worst he seems to get a little disorientated. The Gloucester home game versus Sale had the full spectrum: his miscalculation of a bounce putting his team in trouble; his scything run for the decisive try. My hunch is that Marshall is on an upwards curve, which will continue next season. His battle with recent recruit and fellow kiwi Jason Woodward will be fascinating. 14. Josh Adams – a young Welshman who has had opportunity handed him by Gary Gold, and grabbed it with both hands. Just that little bit quicker than you think, Adams has benefitted from the experienced work of Willison, Te’o and Olivier inside him. Worcester have a clutch of players like Adams; Shillcock, Humphreys and Hammond are just as exciting, but Adams has struck in crucial games. One for those West of the border to keep an eye on; he reads the game very well. 13. Sam James – delighted to see James’ name on the Jones team sheet for Argentina. He is blessed with lots of ball playing ability which has seen him shifted around the Sale backline because of injury. I like him at 13 because of his offloading and ability to break the line. He has a clever boot and distributes well off both hands; defensively sound too. See, not a lot not to like about Sam James. Partnering him up with the outstanding Joe Marchant might be an option against the Pumas. Watch out for them both this summer, they’ll create and score tries. 12. Will Hurrell – Being consigned to the Championship is not where Hurrell should be. Having ploughed fields with his bare hands for Donny the year previous, Bristol got more than their money’s worth this campaign. He started 21 out of 22 Premiership games for the Ashton Gate outfit and his carries, metres made in the midfield, and knack of turning over ball was a massive plus point. Juan Pablo Socino should get a mention here. So often the catalyst of Newcastle’s better moves, he is one of reasons the Tynesiders found themselves healthily clear of relegation. 11. Josh Bassett – Of all the Wasps’ firepower, Bassett is by far my favourite. Not only is he locally grown, a Bedford Blues Academy graduate, he is working his way tirelessly to the top. Still learning, he has become a regular in a galactico backline and kept the likes of Frank Halai from getting a sniff. Rangey and strong, he is incredibly difficult to stop, even if you do get hold of him. For me, he should be viewed as an England candidate, despite the riches that Eddie Jones possesses in that position. James Short also comes into this category. A man who has taken his chances really well for the Chiefs. 10. Owen Williams – For me, a classy operator and one I was genuinely surprised to see Leicester let go. I think his move caught a few people off guard, as much of the fly half merry go round was being held up by George Ford’s dalliances. 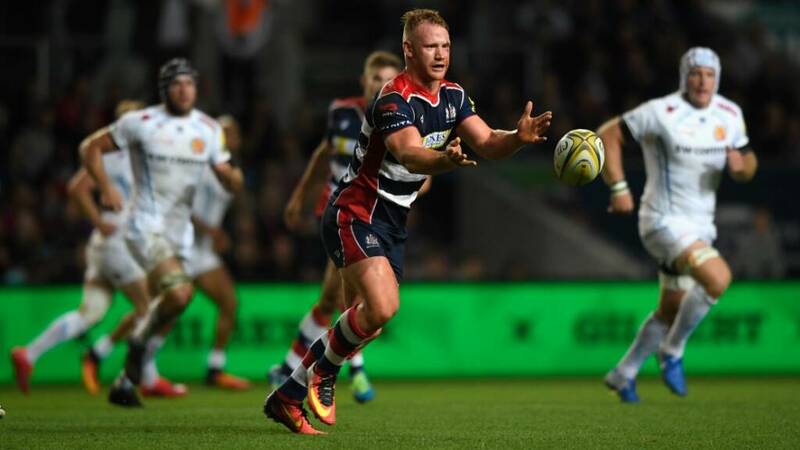 A big and reliable boot, his duel with Freddie Burns has only been to Leicester’s benefit. How he will blossom at Kingsholm will be intriguing. Potentially a better option than those currently employed by Wales’ national team – seems an untapped resource to me. Glad to see him named on the summer tour to SA. 9. Francois Hougaard – Worcester aren’t far away from being a very good side (their matches against the top three are testimony to that), and Hougaard is the glue that sticks them together; without him, things seem a little more fragile. It is a coup for the club that they have been able to hold onto him and if the Warriors can continue to build a team around the Springbok, they will challenge the top six next year. The tempo he creates allows his midfield just that extra few seconds – super footballing brain as well. Dan Robson warrants a shout out, but loses out in this team, just, because he isn’t as integral to his side as Hougaard. 1.Ellis Genge – It’s laid out in front of him, and there’s a long way to go, but Genge could become a folk hero for Leicester and England. If he keeps heading down the same road, there is every reason to stay excited. Gnarly, uncompromising, smart and robust, he is starting to smile his way through matches, which in itself, is both impressive and terrifying. Offensively such a threat; he’s beaten more defenders than Betham, Burns and Veainu, his scrummaging will improve with age. I also don’t mind his occasional hotheadedness; the coalface can get incandescent. Little nod in the direction of Val Rapava Ruskin too. A delightful piece of Georgian furniture with plans to stay in England, Ruskin has been special for the Warriors this year; he’ll be at Gloucester next. Worth keeping an ear out for his efforts. 2. Richard Hibbard – Staying in the South West, this has been easily Hibbard’s best season at Gloucester and some argue it should have seen him pushing Ken Owens and Scott Baldwin for more international caps. Could well have taken it easy this term but Hibbard features in the Gloucester top five for turnovers, tackles and carries this season; no one started more Premiership games in Cherry and White either. He may look like a roadie, but, for me, Hibbard is Kingholm’s lead guitarist. 3. Ross Harrison – difficult to look past Sinckler’s heroics and indeed, the wiley old feats of John Afoa, but Harrison played a shed load of minutes and was voted Sale’s players’ player, which is generally a good indication of contributions. Comfortable on both sides of the scrum (which is why I nabbed him for tighthead here) and still young, Harrison has been doing a lot of the right things. Will be interesting to see how he goes next year, and, indeed, whether Sale can hang on to him. There was lots expected of Paul Hill this season, which hasn’t quite come to fruition. It will though, he’s too good a player. 4. Charlie Ewels – Like Tom Ellis, who misses out at 6, Ewels has taken his chances well under Todd Blackadder. Athletic and quick (they make lock forwards differently nowadays) Ewels got capped quite rightly back in November. He has had his late season marred by injury but still makes it on the plane to Argentina: in a crowded England marketplace, he has a tidy looking stall. Bryn Evans should also get circled, he is the gift that just keeps on giving up at Sale. Dom Barrow for Tigers too. Ewels’ addition conspicuously sidesteps the Herculean efforts of Joe Launchbury this season: fitting, considering the Lions’ selectors did that very thing. 5. Callum Green – Perhaps a little left field, but a wonderful example of the industry of the North East. Like Juan Pablo Socino and Mark Wilson, started 21 of the 22 Premiership games for Newcastle Falcons and kicks out a huge amount of wattage: 235 tackles (averaging just over 11 a game) and a tackle completion rate of 97%; key man at their lineout and a fair few useful carries to boot. Some attractive names gathering at Kingston Park next season; Green will remain one of the first on the team sheet. James Horwill could have got in here; he is, after all, the best rugby playing Australian at this current time (!). 6. Michael Rhodes – Perhaps not as eye-catching a signing as some, but when Saracens brought Rhodes into their ranks, they knew what they were getting. More tackles than anyone else this season in a side that prides itself on its defensive prowess, his speed back onto his feet is pretty phenomenal too. Team-mate Jackson Wray could feel hard done by, as could Falcons’ Mark Wilson and the aforementioned Ellis but Rhodes is a veritable machine. Contentious, I know, but Rhodes becomes a victim of the lengthened residency rule; he could have been a useful weapon for England in 2019. 7. Guy Thompson – I love watching Thompson. As dynamic as it gets for back row forwards in the Premiership and, in way, it’s a crying shame that international honours seem to have eluded the former Jersey man. Wasps’ attacking game thrives on genuine ball players, and like colleague Thomas Young and Leicester’s Brendon O’Connor (who could have easily been given this spot) Thompson plays an explosive game. He beats defenders really well and produces front foot ball from which so much is built. Defensively sound and a clever pilferer, Thompson, for me, is a wonderful option. 8. Luke Hamilton – there are, currently, better 8s than Hamilton in the top flight; Faletau, Vunipola, Picamoles, Hughes. But the Welshman, who really benefitted from his sojourn with Agen in France, has put on some conspicuous displays in Tigers colours. I love his story too, out of contract in Cardiff, he fled to a foreign field and worked hard. And people who work damn hard are always fortunate. Very keen to see how he follows up this season. There you go. By all means, have your say. It’s been another wonderful nine months in the Aviva Premiership. Good news is, it’s not long ’til all starts over again. This entry was posted in rugby, Sport and tagged aviva premiership, bath rugby, bristol rugby, exeter chiefs, gloucester rugby, harlequins, leicester tigers, newcastle falcons, northampton saints, Rugby union, sale sharks, Saracens, wasps, worcester warriors. Bookmark the permalink. I had a feeling someone might pick up on this. James Short gets a mention and bizarrely it was only after I’d written this piece did I notice my anti Chiefs bias. Of course, the clever response would be to say that they are too much of a good team to pick any individuals out… will that do Toby?